Here’s a nicely compiled repair guide for your PSP, organized by wanclickid, and duly tipped to us by pspx256. 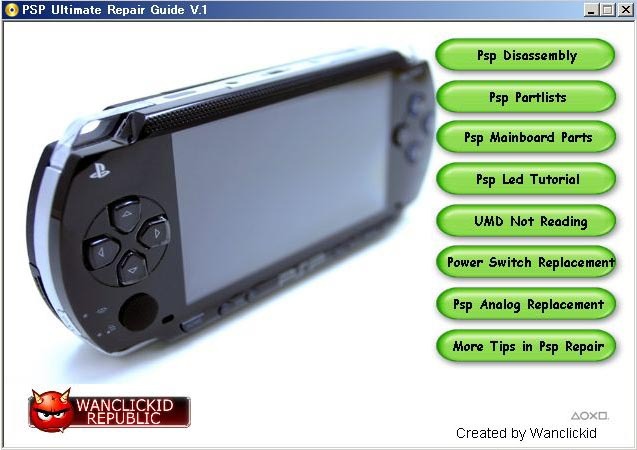 The PSP Ultimate Repair Guide v.1 provides you a step by step how-to on several hardware issues. Featured in this tutorial are the steps for PSP disassembly, LED tutorial, what to do when your UMD does not read, power switch replacement, analog replacement, and more tips for repair. It’s actually simplified yet comprehensive, so am sure it’ll be helpful to the new users out there. Only thing lacking for me would be a “Back to Menu” button. This is another minor update for bug fixing and introducing support to Dark_AleX’s LEDA. The advancded multi-tasking feature is now in beta testing and will be released when it’s ready. I got emails from various people asking if there is any way to join the iR Shell beta testing. I’ll make an official announcement here. For donators who donate US$15 or more, you will receive an invite email to the private forum which you can download iR Shell SE releases (Special Editions / Betas) and also obtain technical support. – Added support to Dark_AleX’s LEDA. Pls note iR Shell only supports LEDA version 0.2. To enable LEDA support within iR Shell, enable the option “Legacy Homebrew Support via DA’s LEDA” under iR Configurator. – Increase remotejoy framerate to around 30 FPS while running PS1 games. – Fixed most game audio stuttering while mp3 is playing. – Fixed PPA plugin crashing with nethostfs/usbhostfs access. – This is an update, unzip and merge to your previous 4.9 or 4.91 release.